I want to transfer my domain to AccuWebHosting.com. How do I proceed? 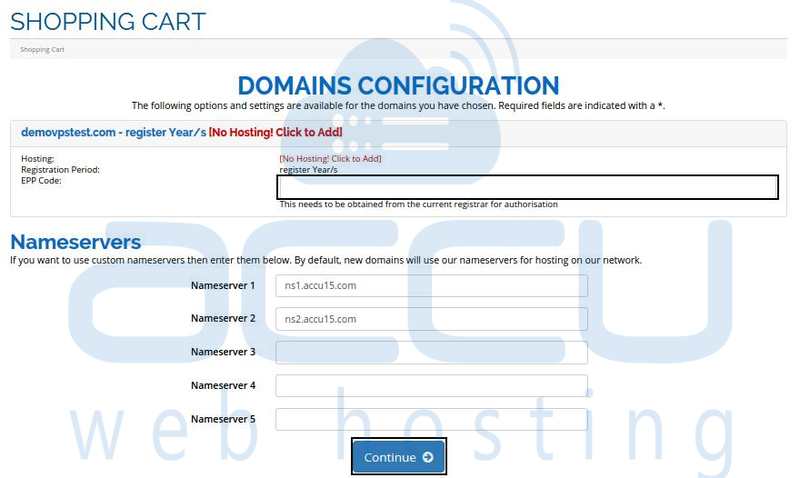 Transferring your domain to AccuWebhosting is easy and hassle free. Just follow few easy steps and have your domain transferred to AccuWebHosting. 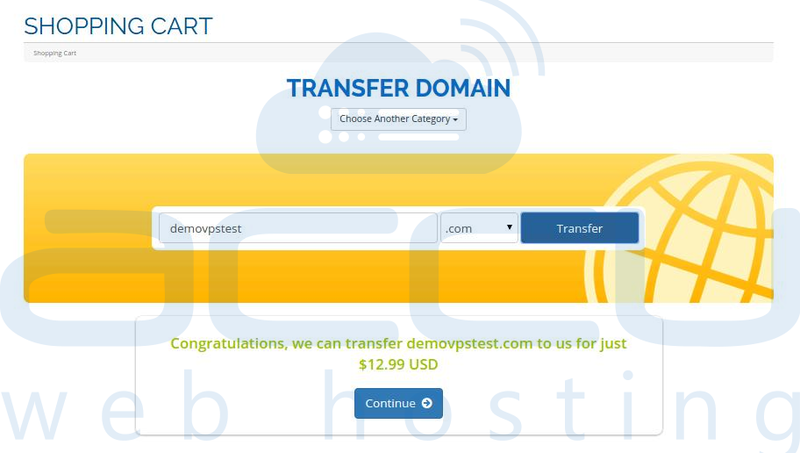 Enter domain name you wish to transfer, select the extension from the drop down menu and click on Transfer button. At the next screen, enter the EPP Code you have obtained from the current registrar. If you want to Purchase Web Hosting Services for your domain click on [No Hosting! Click to Add] link. A new window will be opened where you can select the appropriate hosting category and hosting plan of your choice. Under Nameservers section, you would see the default nameservers entered. However, if you want to use any custom nameservers, you can enter them in the given nameserver boxes and click on Continue button. At the next screen, you would see following sections. Review and Checkout: Here you can review domain name description and price. Make sure you have entered correct domain name. 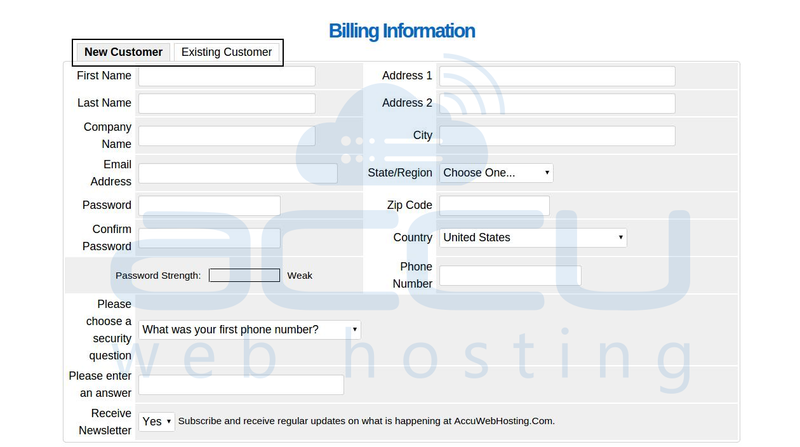 Billing Information: If you are a new customer select the New Customer tab and fill up the form. If you are an Existing Customer, enter your admin Email address and Password. At next section, choose security question from the drop down menu and enter your answer. Make sure that you enter the correct details since you would need them while resetting the client area password. Payment Method: select PayPal method, accept the Terms of Service and click on Checkout page. You will be redirected to PayPal website, enter your PayPal login details and make the payment. If you wish to make the payment via Credit Card. Enter the following details and complete the order. Card Type: Select the card type you would use to make the payment. Expiry Date: Select the expiry date of your Credit Card. CVV/CVC2 Number: Enter the CVV code of your card. If you do not know how to get the code then click on "Where do I find this?" link. Recurring Subscription: Set this option to Yes if you would like to create an automated recurring through your Credit Card. If you would like to make one time payment then select No from the dropdown. Click on Checkout button and you would see following progress bar. Please do NOT close the browser tab or refresh the page while payment is being processed. Once payment is successfully processed, you will receive following order confirmation and order number. NOTE: Domain transfer process may take 5 to 6 business days after placing your domain transfer order. You would receive domain transfer followup emails from AccuWebHosting informing you about the transfer status. How to get the EPP code from client area? How to Reset Password of DirectI Control Panel Account? How do I create SRV record for my domain? Can I change my domain name registrar to AccuWebHosting.com? How do I manage my domain name via Enom panel?